Butterfly Reflections, Ink. : Happy ❤️ Day! 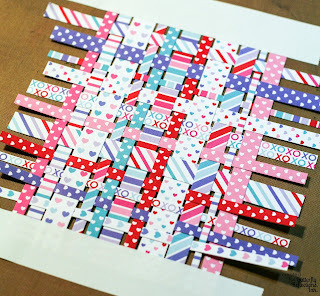 I then dotted Liquid Glue onto the backside of all of my patterned paper strips--leaving the low-tack tape on for this step makes it easy. Believe it or not, the panel is pretty sturdy at this point, especially with the tape-reinforced top and bottom edges. Once the adhesive was applied, I stuck the whole panel down onto a piece of Lawn Fawn Moonstone Card Stock and let it dry. The next step was cutting three pieces of white cardstock using a frame die like This One and gluing them together using the same liquid glue. 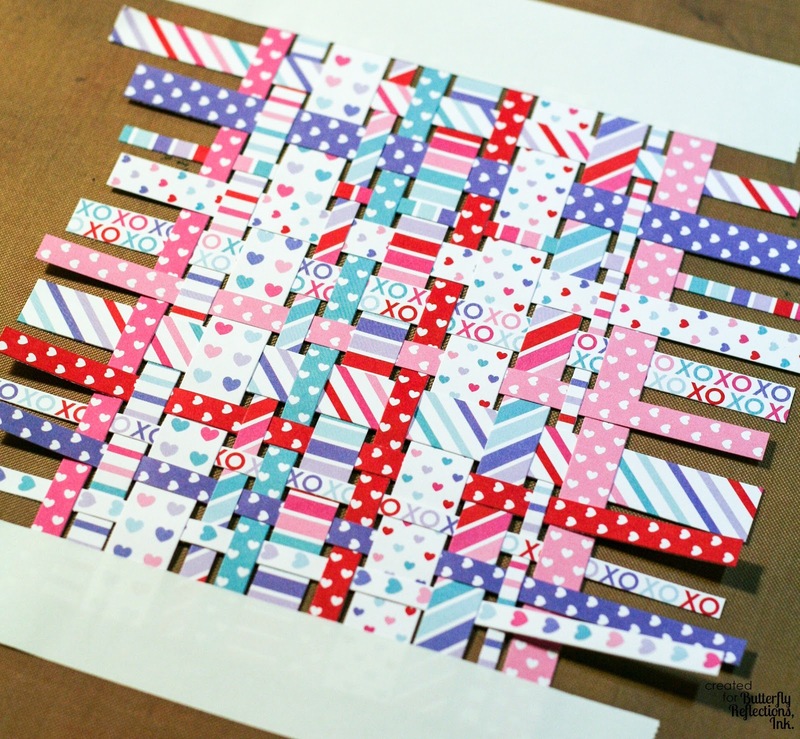 I then glued the stacked frames on top of my woven piece (that at this point is glued to the Moonstone cardstock) and used Scissors to trim the excess patterned paper/moonstone cardstock away from around the outside of the frame. I created a card base using Lawn Fawn Ballet Slipper cardstock in a top-folding, A2 (4 1/4 x 5 1/2) format and adhered my woven piece to the card base using the same liquid glue. I used my Lawn Fawn Stitched Heart Stackables die (the medium-sized heart) to cut a piece of vellum and set it aside while I worked on the sentiment. I used my Lawn Fawn Scripty Love die (side note--even though this die has been out for a long time, I just recently bought it and have been using the heck out of it--I love it!) 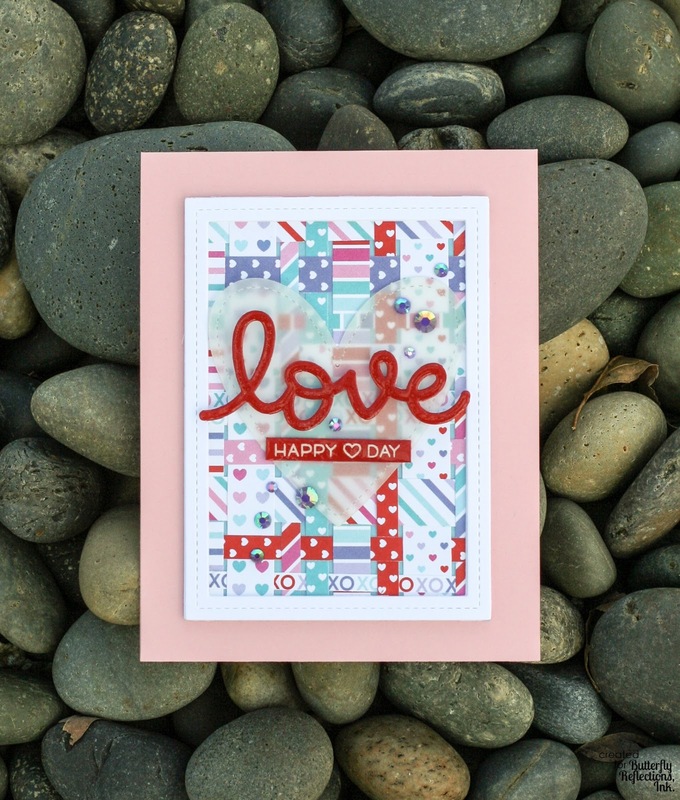 to cut out two die cuts using Lawn Fawn Chili Pepper cardstock and two out of white cardstock. 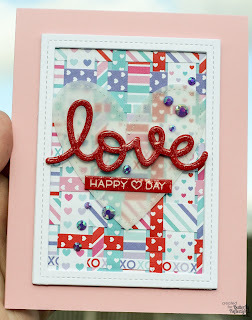 I glued all of them together (the two white die cuts on the bottom, the two red ones on top) using the Mono Multi. I then brushed the top red die cut with my Spectrum Noir Sparkle Pen--Clear Overlay and then topped it with a layer of Glossy Accents. 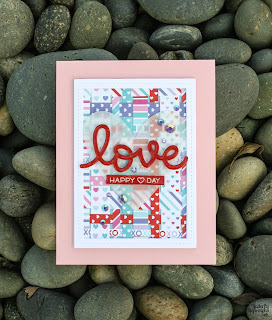 I set that aside to dry and then heat embossed my "Happy ❤️ Day" sentiment from Lawn Fawn Let's Toast onto a small strip of Chili Pepper cardstock using Lawn Fawn White Embossing Powder, VersaMark, Anti-Static Pouch, and a Heat Tool. 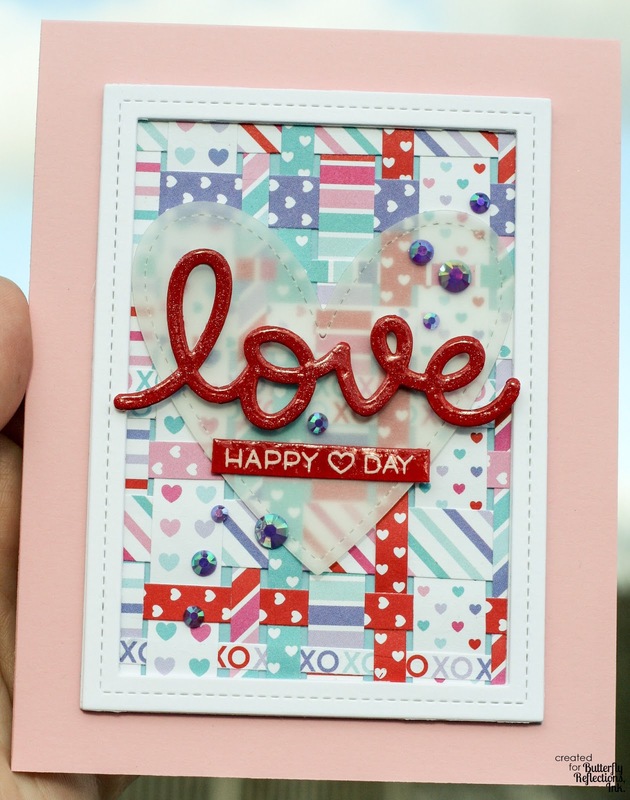 My sentiment strip looked a little dull next to the glossy, glittery "love" die cut, so I brushed a little sparkle inside the heart and then topped the sentiment strip with Glossy Accents as well. 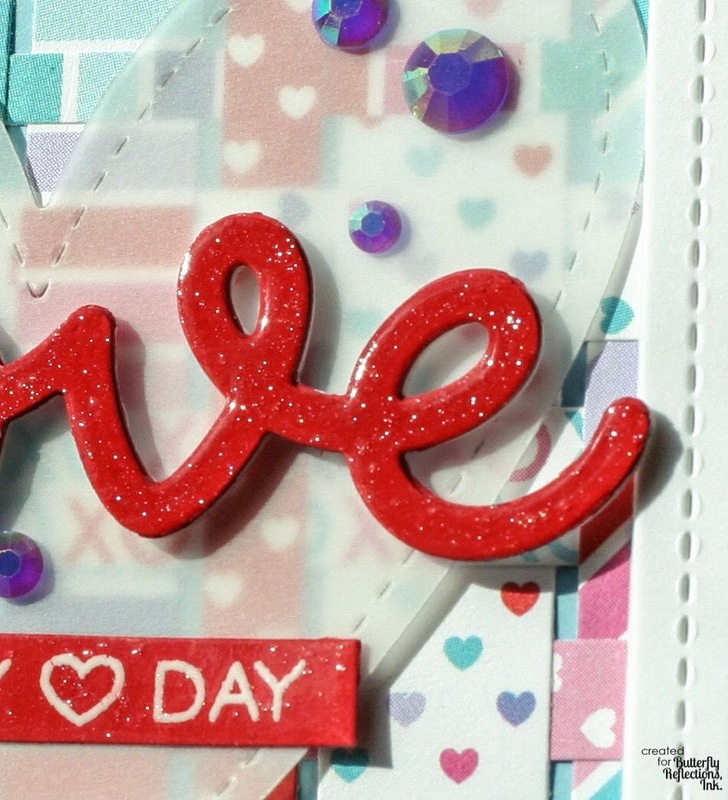 Once the Glossy Accents were completely dry, I applied liquid glue to the back of the "Love" word and "Happy Heart Day" strip, adhered them to the vellum heart, flipped the heart over, applied glue to the back of the vellum. I made sure to conceal my glue underneath the word die and sentiment strip. Then I flipped the heart back over and adhered it to the woven panel. I used a combination of Micro Glue Dots and liquid glue to adhere my jewels--the darker purple gems from the Sugar Plum Jewels Mix by Pretty Pink Posh.